Experience luxury and solitude in this loft right on Santana Row, with easy access to shops and restaurants right below you. The Row has become a magnet for both locals and out-of-towners. It's the place to stay in SJ with it's chic European charm. Chic open concept loft/condo with endless upgrades in the Santana Row Margo building. Modern glass tile & custom paint throughout, upgraded bathrooms. Two plush queen platform beds offering a serene & private nights rest. Custom lighting hardware throughout and one FREE dedicated underground parking space in secure garage below the building. Luxury condo is located in the most desirable area in Silicon Valley, Santana Row. "The Row" is an upscale residential, shopping, dining, and entertainment complex in San Jose, California. Everything is within walking distance. There is no need to drive. The condominium is perfect for business travelers or family vacationers. The loft has two spacious queen beds with a full and half bathroom. Walk-in closet upstairs for all your belongings. It's an open concept loft. • 2 Queen size beds, full bathroom upstairs, and half bathroom downstairs. • 1 Twin High End Air Mattress can be set up for the 5th person upstairs. • Complimentary High Speed Wi-Fi internet. • One Complimentary assigned underground parking space. • Complimentary Keurig coffee and tea. • Business ready: Work desk, Wifi, printer, and paper. • Modern full size kitchen with granite counter tops and stainless steel major appliances. • Facing the Row for the best people watching spot you could ask for. • Levi's Stadium is close to Santana Row for those wanting to catch a game. Taxi and Uber is available. • If time of booking is within 7 days of arrival, a government issued ID is required prior to check-in. This is due to recent fraud activity and for both of our protection. Santana Row is an upscale outdoor shopping mall in the heart of San Jose. Santana Row offers a mix of brand name shops, local boutiques, twenty restaurants, nine spas and salons, CineArts movie theatre, and the boutique hotel Hotel Valencia. The shops range from luxury brands such as Gucci and Kate Spade to more casual brands like Diesel, H&M, Ann Taylor LOFT, and Urban Outfitters. Also on The Row include restaurants ranging from local concepts like Left Bank Brasserie and sister restaurant LB Steak, Pizza Antica, and EMC Seafood Bar, to chains like The Counter, Maggiano's Little Italy, Pinkberry and a Yard House. The district is anchored by Crate & Barrel, Best Buy, The Container Store as well as Valley Fair Shopping Mall. Visit the Santana Row website for more info. Safeway (Grocery), CVS (Pharmacy), Bank of America, Chase Bank, Wells Fargo Bank, Winchester Mystery House, just to name a few places, are all within a 2 min walk from the unit. Conveniently location with easy access to highways 101, 880, highway 280, 17 and 87. • To SJC (San Jose Airport): 5.9 miles / around 13 min. • To OAK (Oakland International): 37.5 miles / around 43 min. • To SFO (San Francisco International): 37.9 miles / around 45 min. • 8.4 Miles from the brand new Levi's Stadium. Home of the 49'ers. Public transit in San Jose (and the entire South Bay portion of the Bay Area) is provided primarily by VTA, which operates bus and light-rail (modern streetcar) service. Caltrain also provides rail service throughout a portion of Santa Clara County. BART is also an option within the Bay Area. This condo is very clean and kept up to date with no expense spared. The pictures reflect it's current state and there are no surprises. 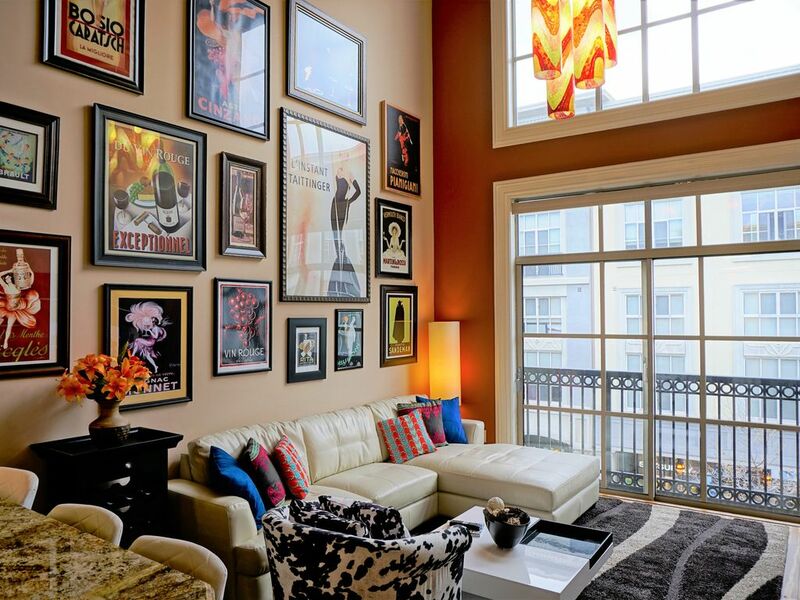 This loft is directly on Santana Row street above Paper Source and Parker Warber. From your window you can see Tesla Motors, Straits Cafe, Gucci, and Cocola Bakery. It's really the ultimate location if you are staying on Santana Row or San Jose. Hello, I'm Johnny and have multiple listings on VRBO and have been listing the condo on other popular sites where I have plenty of five star feedback and positive reviews so book with confidence. I'm a working professional in the Silicon Valley and was also raised and born here in the Bay Area. I personally have high expectation when staying away from home and I hope my condo meets yours knowing you are traveling away from your home. We were in town visiting colleges with our son. This was the perfect spot - close to great dining and shopping - plus easy access to all highways to get between Silicon Valley, San Fran and the East Bay. Highly recommend! We were in town for business and loved the location, the decorations and how clean the condo was! Not to mention the bed was comfortable and all amentities fit perfectly! We will be back again! Stayed here before and it is still AWESOME!! This is a great property. Super clean and very comfy. Location does not get any better!! Johnny makes sure you have everything you need. He is very helpful. This place was awesome, walkable, huge high ceilings and comfortable. I will try to stay here for now on every time I come to the Bay Area. We had a wonderful stay at Johnny's property in Santana Row. It was so fun to enjoy the shops and restaurants in Santana Row and then relax at the condo. Johnny was very helpful and responsive to any questions we had. I would highly recommend staying here. Santana Row is the heart of San Jose and has everything you need right downstairs from the condo and in walking distance. Just do a quick internet search on it and you will see all the restaurants and shops.